Kilimanjaro is the highest mountain on the African continent at 5895m. Its snow-capped summit rises high above the vast African plains and huge glaciers welcome you at the summit together with spectacular views. A tremendous award for pushing yourself well out of your comfort zone. If the above dates do not suit you or you prefer one of the other trekking routes (Lemosho or Rongai routes) and you have a group of over 10 people, please get in touch as we’d be happy to set up a date that meets with your requirements between January – December (please note, there are differing weather patterns throughout the year). Simply email: info@adventurousewe.co.uk or call 01492 588 069. Kilimanjaro, named ‘Kilema Kyaro by the Chagga people meaning ‘that which cannot be conquered’ is situated south of the equator in Tanzania at 19,340 feet (5895m). Kilimanjaro is Africa’s highest mountain and the highest “free standing” mountain in the world, where huge glaciers flow down from the summit. Spectacular views and beautiful ice formations are the reward for the successful trekker, as well as the satisfaction of “topping out” this mighty African peak. 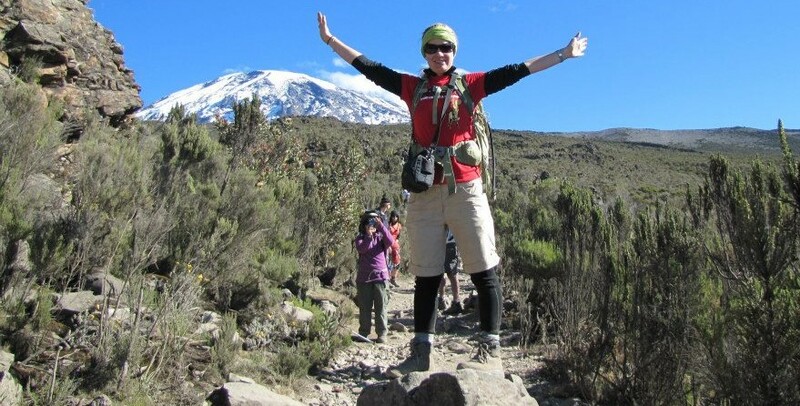 Any reasonably fit person who enjoys walking can reach the summit of Kilimanjaro, our itinerary is designed to give you the best chance or reaching the peak of this iconic mountain. This trek is graded extreme due to the high altitude. Your carefully planned itinerary gives you 7 days trekking on Africa’s highest mountain, which means plenty of time for acclimatisation and soaking up the ever changing scenery. There is a night ascent to the summit under the glow of moonlight presenting you with incredible views and memories of a high altitude sunrise that you will remember for many years to come. All our local guides go through a stringent bi-annual training program and our logistic team based in Moshi monitors your climb form start to finish. The Machame Route, also referred to as the Whiskey route, is one of the most popular routes on Kilimanjaro and a favourite for Adventurous Ewe given that it has one of the highest summit success rates. This is due to the topography of the route which allows climbers to “trek high & sleep low”. This route approaches Kilimanjaro through forest and moorland from the south-west and joins the Shira & Lemosho routes before traversing beneath the southern icefields of Kibo. The rainforest is extremely beautiful and there is a tangible sense of ‘wilderness’ once the higher elevations are reached. The views of Mt. Meru floating on the clouds are simply unforgettable. This route also passes the spectacular formation of the lava tower and onto the exciting climb of the Barranco Wall with the support of your expert Mountain Guides and Assistant Guides. You will make your final ascent to the summit by the stunning Barafu route. Your descent is via the Mweka route where there is a chance of seeing Colobus monkeys and plenty of bird wildlife. The tour includes all accommodation, private transfers to and from Moshi, park entry fees, porters, local guides, cook and meals whilst camping. Breakfast is included in the Moshi hotel. All meals are provided other than one lunch and one evening meal in Moshi – please allow about £20.00. It does not include insurance, airport tax if applicable. If anyone needs to leave the group at any point during the trip (for reasons such as an early descent from Kilimanjaro due to altitude sickness or other reasons), all expenses incurred until re-joining the group on the itinerary described in these Trip Notes are the responsibility of the individual(s) concerned and must be paid to our local operator before leaving Tanzania. The easiest way to book your trip is online via the Adventurous Ewe website. You will need to pay a non-refundable deposit of £250 at the time of booking. The full balance is required to be paid no less than 4 weeks prior to departure. For a new trip set up on dates that suit you, your charity or corporate organisation, we require just 10 people. The length of the trip may vary between 10 – 12 days dependent on your route selection and time available. For further information or to discuss the various routes and timings available, please get in touch with us at email info@adventurousewe.co.uk or call 01492 588 069. Depart the UK and fly to Kilimanjaro International Airport. Adventurous Ewe can assist with flight bookings if you wish or you are welcome to book your own flights which allows you greater flexibility and the opportunity to use any frequent flyer points. Arrive Kilimanjaro A warm African greeting is awaiting you on your arrival at Kilimanjaro International Airport where you will be transferred to your hotel. Your Guide will provide a full trek brief in preparation for your iconic mountain ascent and there will be time to ask any questions. There’s time to relax and organise your kit ready for tomorrow’s departure. Dinner and hotel accommodation provided. Machame Gate to Machame Camp Full of excitement and naturally a few nerves, you will be transferred to Machame Gate passing vast African plains and the chance to catch a glimpse of the mighty Kilimanjaro itself. It’s hard to imagine that you may be standing on the summit in just a few days. On arriving at the Gate you will sign in a register book whilst your crew finalise packing all the food and equipment. Your Guide will introduce you to some of the amazing Assistant Guides and Porters, people who will inspire and support you throughout your trek. The first day of the route climbs steadily through magnificent forest covered with a thick canopy of vegetation. It can often be muddy underfoot and the rain can penetrate the roof of vegetation cover as well. Trekking steadily upwards you will notice the change in vegetation as it starts to become smaller as you reach your first campsite on the mountain, Machame Camp at 3100m. Machame to Shira Plateau Arising from your first night in camp on Kilimanjaro you will trek upwards to Shira Camp. The first section is relatively steep and altitude is gained rapidly, however as you look behind you the views are stunning peering across the low vegetation as the African savannah stretches for miles. The zone you pass through today is known as the heath zone where attractive helichrysum and lobelia cover the landscape. Various geologic features can also be seen from lava tubes to glacial valleys. On arrival at Shira Plateau you will be rewarded with panoramic views of Mt Meru rising high above the clouds. Your second night on Kilimanjaro is at Shira Hut Camp at 3800m. Shira Plateau to Barranco Camp Today is an acclimatisation day as you trek high and sleep low. The route heads east towards Kibo and the landscape changes as you ascend into alpine desert. For those who are feeling strong you can trek higher up to the amazing rock formation of the Lava Tower before descending to Barranco Camp at 3900m. The day has been spent at high altitude so you will sleep low to help your bodies adjust to the altitude and acclimatise. Barranco Camp to Karanga Camp Having camped at the base of Barranco Wall with the giant groundsels (Senecio species), you will start your ascent of the Wall. This is quite often people’s favourite day on the mountain. It involves a non-technical scramble over rocks and a steep ascent though your dedicated crew are with you and on hand for any support that you may need. It is amazing to watch the porters scale this section carrying all the kit. On a good day the view from the top of the wall is incredible and stretches for miles. Often the clouds circulate in the morning and if feels like you are standing on top of the world. With the peak of Kilimanjaro behind you, it’s a great chance to grab a quick photo before traversing over scree and ridges below the Heim, Kersten and Decken Glaciers to the Karranga Valley at 4000m. Today is a relatively short day hiking and lunch is served at Karanga Camp. In the afternoon there is the option to walk higher for great views of the southern walls of Kibo and deep glacial valleys or you can simply relax in camp. Overnight at Karanga Camp. Karanga Camp to Barafu Camp Today is another half day ascending to Barafu camp, your base camp in readiness for your summit attempt. Once again lunch is taken in camp allowing plenty of time to relax before the summit bid. Desolate alpine desert and at times strong winds rip over this camp and yet in the evening splendid views of Mawenzi peak can be seen. Dinner is served early allowing you to get some rest prior to getting up and ready for the final ascent. Overnight Barafu Camp at 3983m. Barafu Camp to Kilimanjaro Summit Awakening under a blanket of stars you will have a quick hot drink & snack before starting your summit bid to the Roof of Africa. Under torch light you will begin ascending to the rim of Kibo Crater and the Glaciers. With a line of head torches illuminating the path you will climb the scree path for 5 – 6 hours though you will be rewarded with gaining incredible height. Patience and persistence is the name of game to reach the summit. The plan is to be on the crater rim at Stella Point 5750m as the first rays of sun light rise over the neighbouring mountain Mawenzi and the spectacular ice cliffs. This will be a sunrise to treasure as it will give you the much needed boost to make the two hour round trip along the crater rim to Uhuru Peak (5896m) the Roof of Africa. Remember to leave enough gas in the tank for the descent back to Barafu for a short rest some breakfast. 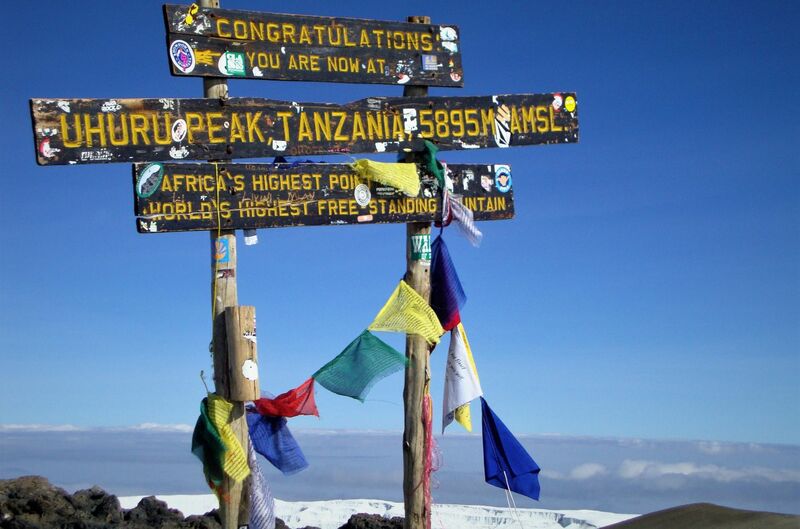 From there you will continue to descend down to Mweka Camp at 3600m. Free day Following your 7-days on Kilimanjaro, you are treated to a free day which gives you the chance to explore Moshi or simply relax in your hotel. There there are some good markets in Moshi and a few cafes where you can relax with your fellow team-mates and reminisce about your mountain adventure. There is a mid-afternoon transfer to Kilimanjaro International Airport in preparation for your return flight to London full of stories to share with your friends and family back home. Please note, lunch and dinner not provided on this day. Arrive back in the UK with memories to last a lifetime and new found friends. All meals are included within the trip cost apart from during free time on the last day of the challenge. On trek the emphasis is on a varied and well-balanced diet with a greater amount of fresh fruit and soup to maximise the daily intake of fluids to help with acclimatisation. Fully purified and treated water provided whilst trekking. All other drinks at the hotel/restaurant will need to be paid for on an individual basis. Bed Tea – tea or coffee served to your tent door in the morning (a real treat). Breakfast – consists of seasonal fresh fruit, porridge, cooked eggs, sausage, bacon and toast. Energy snacks are provided for the daily walk such as biscuits, bananas, and chocolate bars. Bringing your own snacks can often be a treat especially when trekking at higher altitudes. Be sure to bring some of your favourite treats for summit night as these will be a welcome boost in so many ways. Lunch – either a packed lunch on longer days or, more usually, a hot lunch served in specifically set up lunch camp. A hot lunch typically consists of soup, bread or pancakes, cheese, tuna, jam, peanut butter, pasta salad and cake. Afternoon tea – served in late afternoon. It is an opportunity to drink lots of hot drinks and snack on peanuts or popcorn. Dinner – the main meal of the day usually consists of three courses; starter: soup and bread / main: rice, potatoes or pasta with fish, meat or vegetables / dessert: usually fruit. You will be provided with Katadyn filtered water throughout your mountain expedition. If you wish to bring your own water purification treatment in order to be extra safe, you are welcome to do so. Airport transfers and transfers to and from the start of the trekking point will be via mini bus. All mini buses are fitted with seat belts. All nationalities require a full passport that must be valid for 6 months beyond the intended length of stay. Airlines may not carry passengers holding passports with less than 6 months validity. Most nationalities require a tourist visa for Tanzania, including British nationals. We recommend that you check with the relevant embassy for the most up to date information regarding visas. It is your responsibility to have the correct personal documents and obtain your own visa, if one is necessary. Adventurous Ewe is not responsible for the actions of local immigration and customs officials, whether at points of entry or otherwise. Travel insurance is compulsory for all our overseas expeditions. It is a condition of joining this expedition that you must be fully insured against medical and personal accident risks (to include repatriation costs and air ambulance or helicopter rescue services where appropriate). We strongly recommend that the policy also covers trekking at high altitude (5895m), personal liability, cancellation, curtailment and loss of luggage and personal effects. At a minimum of 4 weeks prior to departure you must send through your travel insurance details to Adventurous Ewe. You will also be asked to present evidence of travel insurance and the insurance company’s 24-hour emergency contact number to your Mountain Leader on arrival in Tanzania. For the most up to date information on vaccinations, you should consult with your GP or travel healthcare practitioner 6-8 weeks in advance of travel. Yellow fever vaccination certificate required for travellers arriving from countries with risk of yellow fever transmission and for travellers having transited for more than 12 hours through an airport of a country with risk of yellow fever transmission, this includes the airports of Nairobi (Kenya) and Addis Ababa (Ethiopia). Tanzania is one of the safest African countries for travellers and serious crimes are rare. But as with all places where tourists and crowds gather petty theft can be a problem. In the same way that health risks can be avoided with a few sensible precautions, so can security risks. This is a tough trek, which reaches an altitude of 5,895m. Even if you consider yourself fit, you might still find the climb very challenging, depending on how well your body acclimatises to high altitude. There is no scientific way to determine how easily you acclimatise, and be aware that the acclimatisation process can also differ from climb to climb. To complete this trip comfortably, it is preferable that you have previous trekking experience in varied and irregular terrain carrying a 35 litre day-pack although this does not have to be at altitude. The walking is not dangerous or technically difficult, though you must be a confident walker with a good level of fitness and head from heights in order to manage sections of the trek. During the trek you will be required to carry your own kit including packed lunches & snacks, drinking water, wet weather gear, additional warm layers and personal items such medication and toiletries. The walking hours stated are given as approximates only. Timings include lunch and photo stops though will vary depending on the pace of your group and weather conditions. Most of the trails on trek are well defined and of good quality but some forest sections can be slippery particularly in poor weather conditions. There is a short rock scramble on Barranco Wall which rises 843 feet (257 meters) above the Barranco Valley. Steep, narrow paths cut back and forth along the rock face, making the Barranco Wall one of the more challenging sections of the mountain, but you will not need any technical climbing skills for the ascent. Though it’s a demanding portion of the trek, most trekkers are thrilled that they get to experience the Barranco Wall and it is a highlight of the Machame Route; even without the physical exertion, the view from the top is simply jaw-dropping! Your guides will position themselves at strategic points on the Wall to help you on your way to the top. The final ascent to Uhuru peak is almost exclusively on scree and loose rock without permanent footpaths but no technical skills are required. During the course of the trip we shall spend time at both high and low altitude, experiencing both extremely cold and quite hot conditions. You should be prepared for an early start every day on Kilimanjaro. We wake up between 06.00 – 06.30 and start the day with a hot breakfast. Hot water in bowls will be available for washing. After filling our water bottles, we start trekking as a group, your trek leader will set a slow pace, with the supporting staff and U.K. Leader walking amongst the group to offer support to the team. There will be regular short breaks to rest and refuel on snacks and water and a longer stop for lunch. On arrival into camp, there will be time relax enjoy a hot drink, before sitting down together for our evening meal and a briefing by your leader on the following day. All of our main luggage, tents and camping equipment will be carried by the supporting porters and will be already set up each evening as we arrive into camp. All main meals – breakfast, lunch and dinner are prepared, cooked and served by our supporting team. Groups of 6+ trekkers will be accompanied by an experienced high altitude Adventurous Ewe Mountain Leader. There are approximately 2.5 members of support staff per person in the group including guides, a medical porter, kitchen staff, luggage, tent and toilet porters. Climbing Kilimanjaro is a tough challenge, but one that is very achievable with the correct training. It requires a reasonable level of strength, stamina and determination. Your training should incorporate aerobic (endurance building), anaerobic (strength building) exercises and some good long walks! We have put together a guide to training for your expedition which will be sent to you once you register for this trip. We have a number of weekends that make ideal training for your Kilimanjaro climb available from Spring to September in Snowdonia. We will also offer a discount on any UK challenges used as part of your training program. Please contact us for more information on training weekends. There will be 2-way radio contact between Adventurous Ewe Mountain Leader, Local Leaders & crew and the Office Base in Moshi Town at all times during your trek. Your Mountain Leader will also carry a Satellite phone for emergencies only and have 24-hour contact with Adventurous Ewe office in UK. In the unlikely event evacuation be required the Tanzanian National Park rescue service have emergency vehicles on standby at exit routes from the mountain. All staff are highly trained with the evacuation procedures. A member of our staff will be carrying medical supplies and oxygen, should it be required. If for any reason you need to leave the group early and come off the mountain, local staff will assist you with your descent and will arrange transfers, accommodation and medical care if necessary. All costs incurred due to an early descent will need to be covered by the individual before departing the hotel. This trip includes five or more overnight stays over 3500 metres/11500ft, where there is a genuine risk of being affected by Acute Mountain Sickness (AMS). If left untreated AMS can be life-threatening. We would expect the majority of a group to notice the effects of being at high altitude, and while most will only feel discomfort, it is not uncommon for a small number of people to need extra care which will be provided by our leaders and local staff. All our trips that spend time at High Altitude follow our standard altitude safety measures. A number of medical conditions or medications can also reduce your body’s ability to acclimatise, and thus will affect your performance at altitude and make you more susceptible to AMS. If you are worried about any pre-existing condition (e.g. heart problems), or unsure of your physical ability, you must seek medical advice prior to booking. You may also wish to discuss medication such as Diamox that may help aid acclimatisation. Please note that while we endeavour to assist all our clients in achieving their goals, there may be times your leader makes the decision to either delay or stop your ascent based on your medical conditions and AMS symptoms. All our Mountain Guides are fully qualified and have high altitude experience. Our Guides are carefully selected to ensure you have the best experience on your trek and with a bit of humour thrown in for good measure. They all have remote First Aid qualifications as well. Kilimanjaro can be climbed at any time of the year but it is usually very wet in the rain forest in April and May. January and February are the warmest months. Above the cloud line the days are warm and pleasant, with temperatures in sunlight often above 20°C, but the nights can get very cold. It is possible for temperatures to get as low as -20°C at Barafu campsite, our highest overnight stop. The daily weather pattern on the mountain tends to be clear mornings with an afternoon cloud build-up that often clears before sunset. In the (European) summer, the weather is usually cloudy at lower altitudes and often sunny above 3,500 m. Please note that mountain weather conditions are never totally predictable and we may meet wet and snowy conditions at any time. On the first and last day of our climb, temperatures should remain warm around the low-mid-twenties, with high humidity, becoming cooler at dusk and at night dropping to around 10-15 C. As we ascend and the vegetation becomes more sparse, temperatures begin to drop dramatically to around the low-mid teens and then into single figures around the 4000m mark – it becomes very cold at night! The temperature falls on average by 1C every 200m in altitude gained. On summit day, we can expect temperatures to fall below freezing. With added wind chill, the feel factor can be as low as -20C! • Staying in smaller-scale locally owned accommodation. Our Tanzanian partner is a member of the Porter Protection Scheme under IMEC and adheres to fair wage and welfare policies for their porters, guides and staff. Nonetheless, the ground staff work very hard and any extra payment is greatly appreciated. A collective tip is usually organised at the end of the trek to split between the porters, guides and support staff. The amount is down to the individual and group size, but a good guideline is an average of USD$150 from each participant. This 2 day safari option is a great way to experience some of Tanzania’s amazing wildlife within a short period of time. A visit to Tarangire National Park and the Ngorongoro Crater offer the best wildlife viewing experience for these two days. The concentration of wildlife in these two parks offers great opportunities to see plenty of wildlife before you head home. 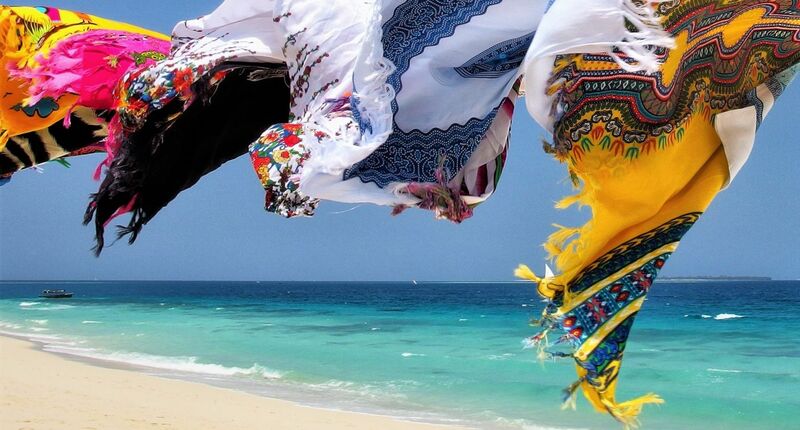 “White sandy beaches, warm turquoise waters and timeless memories” is the best way to describe a beach break on Zanzibar. After a strenuous climb up Kilimanjaro, there is no better way to kick back, relax and soak up the sun before your trip back home. With a wealth of attractions and activities to offer, it is no surprise why thousands flock to this magnificent island. From pristine beaches, lush forests and spice farms to its fascinating history and culture, Zanzibar has it all. Take a walk through Stone Town along the intriguing maze of narrow alleyways and old buildings dating back to the 19th century or visit the lush Jozani Forest where the rare Red Colobus Monkey can be seen. Apart from relaxing on the beach and sipping on Pina Coloda’s there are various activities to choose from including snorkeling, scuba diving, dhow cruises, water-skiing, parasailing, kayaking, jet skiing, windsurfing and kite boarding. For more information or to book one of these optional extra trips, simply get in touch with us at info@adventurousewe.co.uk or call 01492 588 069.